Elizabeth Cady Stanton was one of the premier movers in the original women’s rights movement, along with Susan B. Anthony, her best friend for over 50 years. While Elizabeth initially stayed home with her husband and many babies and wrote the speeches, Susan went on the road to bring the message of the women’s rights movement to an often hostile public. When black men were given the vote in 1870, Susan and Elizabeth led the women’s rights establishment of the time to withhold support for a bill that would extend to black men the rights still denied for women of all colors. The two women worked for over 50 years on the women’s rights cause, yet neither lived to see women get the right to vote when it finally came in 1920. 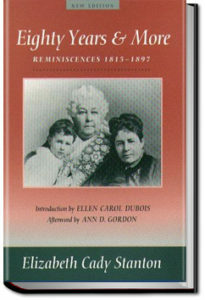 Elizabeth begins her memoirs with this quotation, “Social science affirms that woman’s place in society marks the level of civilization.” She dedicates this book to “SUSAN B. ANTHONY, MY STEADFAST FRIEND FOR HALF A CENTURY”.